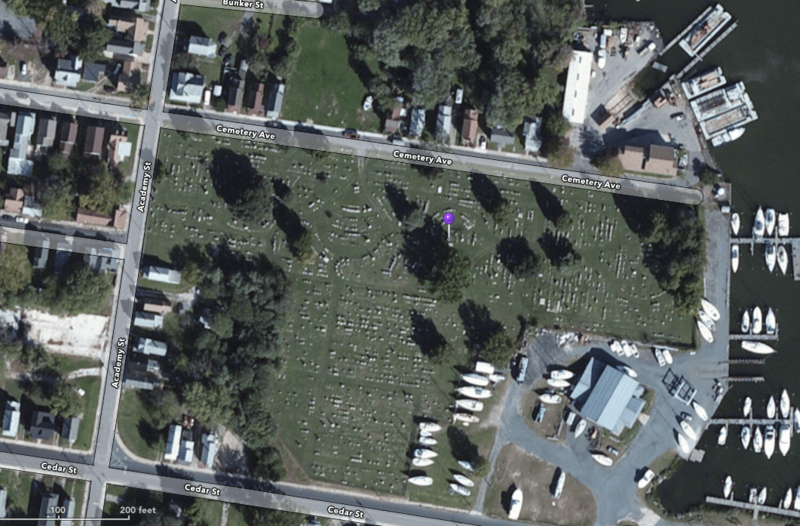 Late last week, I ended up taking a trip over to the Eastern Shore of Maryland with my boss (whom we affectionately call “The Dude”) and in the process, we got the chance to visit Cambridge Cemetery in Cambridge, MD together. There’s some really cool Civil War history in that cemetery that matches up well with the research that I’ve been doing recently. 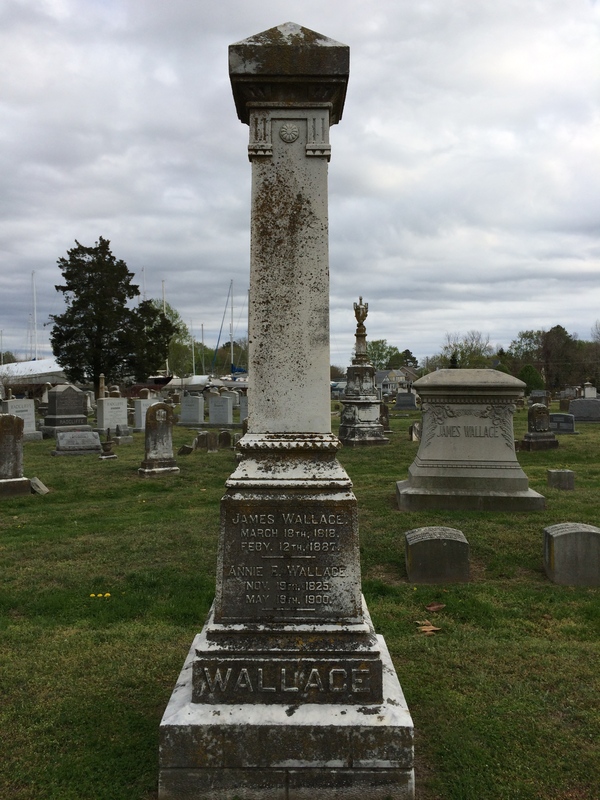 The grave that I went there to find is that of Col. James Wallace, the commander of the 1st MD Eastern Shore. This regiment was raised by Col. Wallace as a home guard unit, but ended up being pressed into service at Gettysburg since the Confederates had invaded the north. Not all the men in the 1st MD:ES saw it that way though, and at least one company resigned over that issue before they left the State of Maryland. The bulk of the unit made it to Gettysburg where it was attached to Brig. Gen. Henry Lockwood’s independent brigade. Col. Wallace led the men in the counter-attack at Culp’s Hill on July 3, and it was these men who fired on the 1st MD (later 2nd MD) battalion CSA – a unit that contained many of their friends and neighbors, and in at least one instance, relatives. These Union men got the better of their Confederate counterparts; taking only 25 casualties out of the 532 men present for duty. Col. Wallace was an interesting character himself. He grew up as a member of a prominent family in Dorchester county, going on to study law at Dickinson College. He got involved in State politics as a member of the American party (better known as the “Know-Nothings” – a mainly anti-immigrant political movement). Wallace was opposed to secession, but was also pro-slavery – mainly because he was a slave-owner himself. In fact, he would resign from the army in December of 1863 over the issue of black men being armed for the war effort. 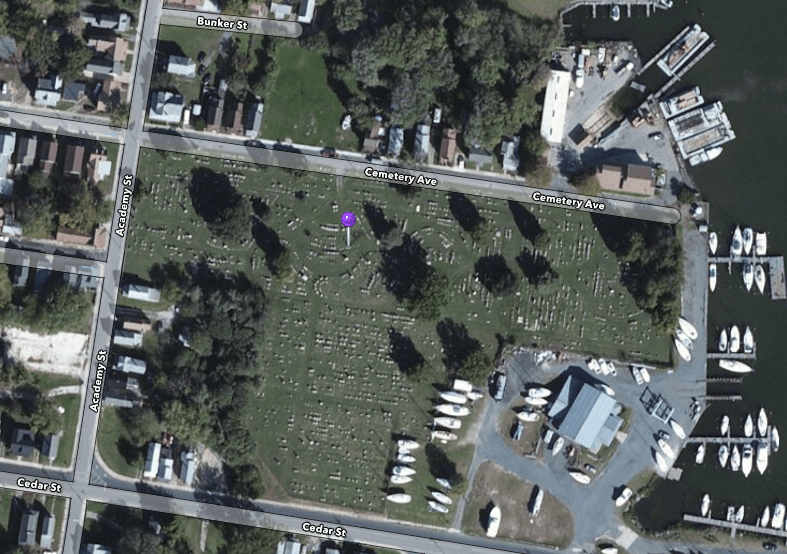 Location of James Wallace’s gravesite. Map by Apple Maps. James Wallace’s Monument. Photo by the author. Nearby, there’s another grave of historical significance in the context of the Civil War: that of Maryland Governor Thomas Holliday Hicks. Like Col. Wallace, Gov. Hicks was born in Dorchester county, and became involved with the Know-Nothing Party. Serving as Governor from 1858-1862, he was in office for the start of the Civil War. While it may seem like a contradictory position to us, Gov. Hicks was both pro-slavery and anti-secession. He felt that if there was to be a Civil War, Maryland as a border state may become the main theater of battle, and he wanted to avoid bringing that conflict to his native State. This led him to attempt to forge a neutral path for Maryland. He avoided calling the legislature into session for several months, and in that time many of the pro-secession members were jailed. When he finally did begin the session, he did so in the pro-union town of Frederick, MD, far from it’s normal place in the pro-southern capital of Annapolis. After his term was up, Gov. 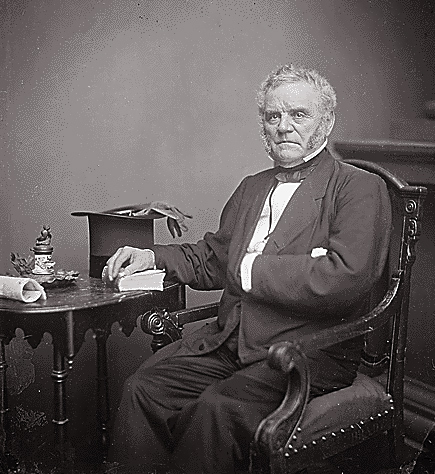 Hicks was appointed to fill the vacant seat in the U.S. Senate left by the death of James Pearce, and went on to become a strong ally of President Lincoln – even going so far as to endorse his re-election in 1864. Location of Thomas Holliday Hicks’ gravesite. Map by Apple Maps. 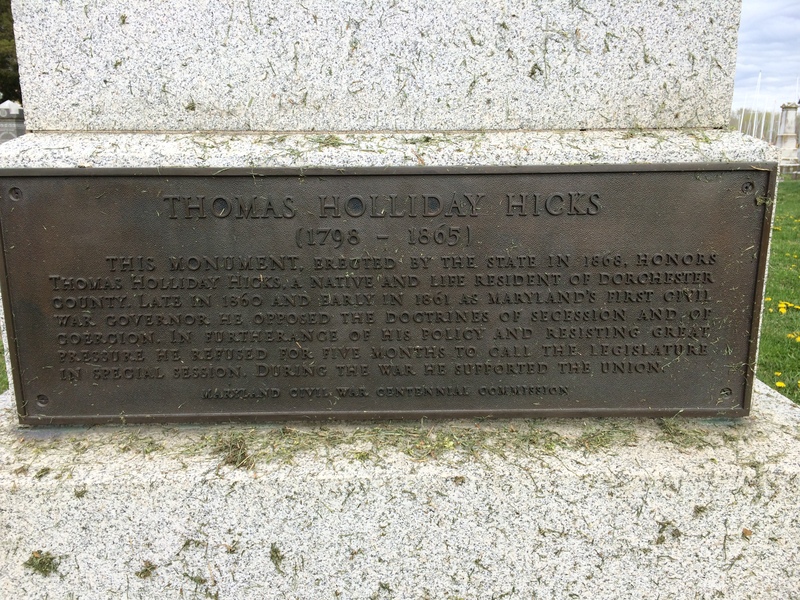 Thomas Holliday Hicks’ Monument. Photo by the author. Detail of the plaque on Gov. 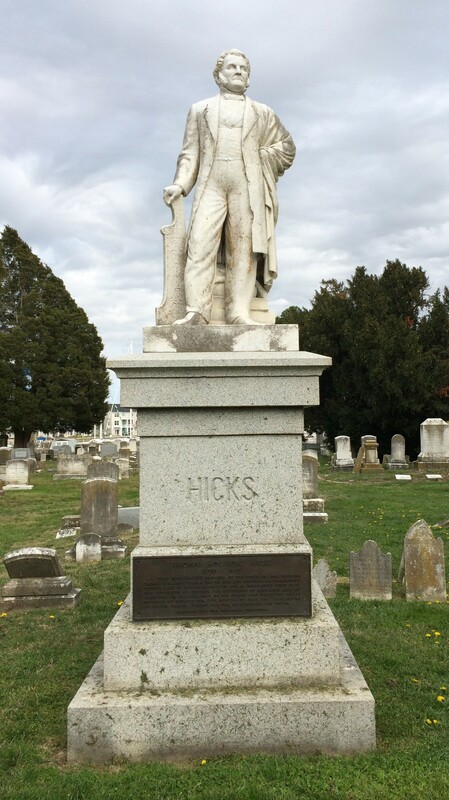 Hicks’ monument. Photo by the author. I can’t help but think that these two men were at least close associates, if not friends; though I haven’t found any evidence of a relationship. 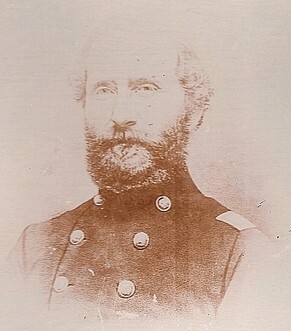 Colonel Wallace was from a prominent family with political connections. Both men grew up in the same area, and with similar political beliefs. The Colonel’s commission that Wallace received was given by Governor Hicks, too – and those were generally not given out based on military merit so much as on who you knew in the State capital. Even if they weren’t close friends, these two men worked together to try and keep Maryland out of trouble and in a peaceful state in the opening days of the Civil War. Misguided as their politics may have been, they deserve to be remembered for their place in our history.